The World's End reunites director Edgar Wright with stars Simon Pegg and Nick Frost. For many people, myself included, this is a cause for excitement. The three previously collaborated on Shaun of the Dead and Hot Fuzz, two movies with huge cult followings. Together with this new one, the films form a kind of trilogy. Whereas Shaun was a loving spoof of zombie movies and Fuzz was the same for buddy/cop pictures, The World's End takes on the science-fiction genre. In some ways, the conclusion of the trilogy is a mixed bag. There's plenty here to like, but it's also my least favorite of the three. Pegg plays Gary King, a semi-functioning alcoholic who decides to reunite his teenage clique. Gary, Andy (Frost), Oliver (Martin Freeman), Steven (Paddy Considine), and Peter (Eddie Marsan), once tried, and failed, to do a bar crawl, hitting twelve pubs in their hometown in one night. Gary – a smooth-talking, outsized personality - convinces them to try again. Some long-buried tensions come out as they begin drinking; Steven and Gary fuel up an old competition for the heart of Oliver's sister Sam (Rosamund Pike), and Andy harbors some hard feelings toward Gary. The reunion, already fractious, is interrupted when the lads discover that their hometown has been overrun by robots, made to look like the local citizenry. Most of the guys want to make a hasty exit, but Gary insists they continue with the pub crawl, so as not to arouse suspicion. 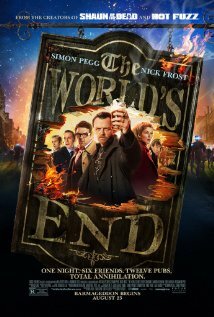 They inch their way toward the final pub – appropriately called The World's End – uncovering a conspiracy along the way. In some respects, The World's End is the most mature Wright/Pegg/Frost movie to date. It deals with issues of friendship, while going surprisingly in-depth on the subject of alcoholism. Most of the guys have grown up. Gary hasn't. He still thinks a life of hard drinking and trouble-making is the best way to live. For this reason, he has trouble understanding why his mates aren't as enthusiastic for the pub crawl as he is. The crisis faced by the group forces him to evaluate his lifestyle once and for all. The World's End takes the time to fully create this character, and then gives him four foils who serve to show him things about himself that he doesn't want to see. Simon Pegg is excellent in the role, illustrating that Gary, who seems to have only one dimension on the surface, actually has multiple dimensions that he keeps hidden. At the same time, the movie is also a loving, knowledgeable riff on the science-fiction genre. Cold in demeanor, with glowing eyes and blue liquid coursing through their insides, the robots call to mind everything from The Terminator and Attack the Block to Village of the Damned and The Stepford Wives. As with Shaun of the Dead and Hot Fuzz, the more you know about the genre being tweaked, the harder the jokes will hit you. Wright additionally stages the action scenes with just the right combination of attitude and humor, so that they're exciting and funny in the same amount. I'd estimate that 75% of The World's End is enjoyable. The other 25% isn't bad, just repetitive. Much of the movie is the guys running into a bar, slamming back pints, and just generally talking about drinking. Then they fight robots. Then the cycle repeats. There's only so many times you can see that before you feel like you've gotten the point. The grand finale is odd, too, in that it's an incredibly long scene that involves one character repeatedly shouting at an unseen force. No real action, or, for that matter, interaction; just a guy yelling into the air. It's a little anticlimactic, and it goes on for way too long. This kind of repetition detracts from the fun, but not enough to kill the buzz. The World's End has enough good performances, snappy dialogue, and cinematic parody/homage to make it a worthy-enough successor to Shaun and Fuzz. And who knows? Maybe a second viewing, as with those previous films, will reveal more layers and jokes that aren't initially apparent the first time. Maybe I won't mind the repetition as much if it does. The World's End is rated R for pervasive language including sexual references. The running time is 1 hour and 49 minutes.